After each week of the NFL season, and once our exhaustive All-22 review process is in the books, PFF will be bringing you the insights from our play-by-play grading of every NFL game with our team of the week. This year we will match the new and improved All-Pro system when it comes to offensive and defensive formation, with a flex player for both sides of the ball that can be either a receiver, slot weapon, tight end or running back on offense, and anybody in the defensive secondary on defense. This gives us the flexibility to reward the player that best deserves it across multiple positions, rather than shoehorning in somebody just to fit a slot receiver or cornerback role. 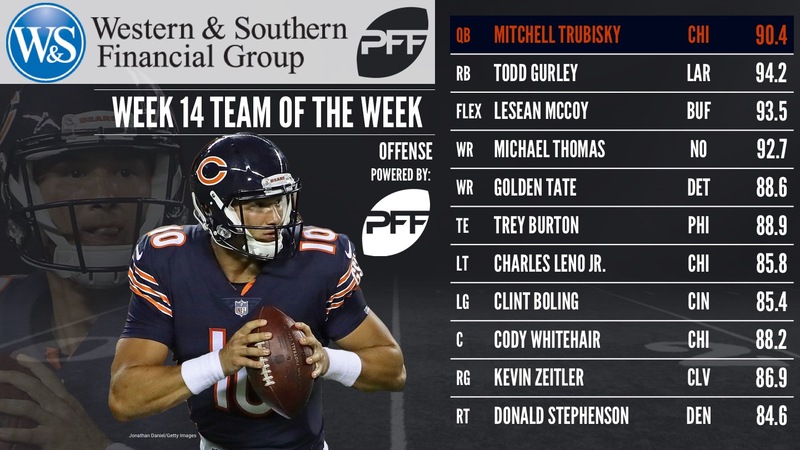 Elite Stat: Mitchell Trubisky had an adjusted completion percentage of 86.7 percent this week. The Chicago Bears finally took the training wheels off Mitchell Trubisky at quarterback and look what happens! Trubisky completed 7-of-11 pass attempts that traveled 10 or more yards down the field and had a passer rating of 113.9 when kept clean in the pocket. Even when pressured, he completed four of six pass attempts for 56 yards, and he added a rushing touchdown on a scramble into the end zone. The Bears have been treating Trubisky delicately all season, but perhaps it’s time to open up the playbook a little and challenge him to do more. Elite Stat: Todd Gurley broke nine tackles on 16 total touches against the Eagles. There has been no greater beneficiary of the changes in Los Angeles than Todd Gurley, who once again had an excellent game even if he was used sparingly in the run game. Gurley carried the ball just 13 times against the Eagles, but rattled off 96 yards on those carries, breaking seven tackles along the way and scoring twice. As a receiver, where he has been at his most devastating this season, Gurley added another 39 yards on three catches. Last season was lost in the wilderness for Gurley, but he is back better than ever in 2017. Elite Stat: Michael Thomas gained 3.34 yards per route run this week. The Saints offense was bottled up by the Falcons for much of the game back on Thursday night, but what threat they did pose came from WR Michael Thomas, who caught ten of the 13 passes thrown his way for 117 yards and a touchdown. He beat five different Atlanta defenders for receptions, including their top three cornerbacks. Drew Brees’ passer rating when throwing it his way was 129.3 for the game. Elite Stat: Golden Tate gained 2.36 yards per route run this week. The Lions managed to squeak past the Tampa Bay Buccaneers this week despite some major struggles along the way, and much of the good offensive performance from that game came from Golden Tate at wide receiver. Tate caught eight of the nine passes thrown his way for 85 yards and a touchdown. He also broke a pair of tackles after the catch to become the first wide out to notch 20 broken tackles overall this season. Elite Stat: Trey Burton gained 2.37 yards per route run this week. With starting TE Zach Ertz out with injury, Trey Burton got an opportunity to step into the limelight and he responded with some huge plays in the shootout with the Rams this week. Burton caught five of the six passes sent his way for 71 yards and he had two critical scores, largely working against Rams safety John Johnson III. Burton didn’t catch anything longer than 20 yards, but he came up big when the team needed him on more than one occasion. This is Burton’s second straight week making this list, he was the top special teams player last week. Elite Stat: LeSean McCoy broke eight tackles on 32 carries in the snow this week. LeSean McCoy seems to have an ability to play in snow blizzards unlike that of other players. For the second time in a huge snow game, McCoy was a force in the game, breaking eight tackles, gaining 3.8 yards per carry after contact and racking up 156 yards on 32 carries in ankle deep snow against the Indianapolis Colts this week. McCoy was the best player on the field in one of the most entertaining games of the year. Elite Stat: Charles Leno Jr. allowed zero total pressures this week. Going up against the Cincinnati pass-rush this week makes this performance from Charles Leno and indeed most of the Chicago offensive line that much more impressive. Leno didn’t allow a single pressure all game, and had some impressive plays in the run game as well, helping pave the way for another dominant display from Jordan Howard against AFC North foes. Elite Stat: Clint Boling allowed no pressures across 40 pass-blocking snaps. Things didn’t go at all well for the Cincinnati Bengals against Chicago, rolling over and getting worked most of the game, but Clint Boling had a fine performance at left guard. He didn’t allow a single pressure all game, despite 41 pass blocking snaps, and nor was he penalized. His run blocking was solid enough, and his play along with that of Russell Bodine next to him was about the only good news for the Bengals offense this week. Elite Stat: Cody Whitehair allowed one total pressure from 34 pass-blocking snaps. The second member of the Chicago offensive line to make team of the week and the third player from that one game, Cody Whitehair was back to his best in the middle of the line for the Bears. Whitehair allowed just one hurry all game, but it was his run blocking that was back to dominance, consistently executing his blocks both at the line of scrimmage and at the second level on Cincinnati linebackers to spring Jordan Howard for significant gains. Elite Stat: Kevin Zeitler allowed zero total pressures from 31 pass-blocking snaps. Kevin Zeitler hasn’t been quite as dominant this season as the Browns were hoping he would be when they signed him as a free agent, but he is coming off the best game of his season and his third strong outing in a row. He didn’t give up any pressures at all for the second week running, and again was a solid run blocker going up against a pretty formidable Green Bay defensive front. Elite Stat: Donald Stephenson allowed just one total pressure this week. Maybe the most surprising name to appear on PFF’s team of the week all season, Denver tackle Donald Stephenson had an excellent game in the team’s destruction of the Jets. Stephenson was actually the only member of the Broncos offensive line to have an impressive day, and while he did surrender a sack, it was the only pressure he allowed across 37 snaps of pass protection, and he also earned a solid grade as a run blocker. Elite Stat: Malik Jackson had six total pressures this week. Getting the boost of playing against the Seahawks’ offensive line this week, Malik Jackson was the player in the Jacksonville defensive front that tore into that unit the best. Jackson ended the game with six total pressures including a sack and a hit, but also had three defensive stops and was a force in the run game, consistently penetrating into the backfield and disrupting Seahawks plays all game whether they were run or pass. Elite Stat: Margus Hunt had two total pressures this week. With just 17 passing snaps, this was never going to be a game to rack up big pressure numbers, but the big interior lineman was a monster in the run game. Hunt was consistently left to Buffalo tight ends to try and block, and they simply couldn’t handle the bigger man in the snowy and slippery conditions. Hunt was destroying blocks on the edge for the Colts defense all game long, and even got his fair share of positive plays against right tackle Jordan Mills, but it wasn’t enough to slow down LeSean McCoy. Elite Stat: DeMarcus Lawrence had seven total pressures from 31 pass rushing snaps. DeMarcus Lawrence looked like DeMarcus Lawrence Taylor when going up against the Giants this week, and it certainty wasn’t the first time this year he has been dominant. He finished the game without a sack, but notched a knockdown of Eli Manning and six additional hurries in one of the most dominant pass rushing displays of the season. Against the run he was no slouch either, destroying the Giants offensive line and recording a pair of run stops. Elite Stat: Mario Addison had eight total pressures against the Vikings. The Vikings ran into trouble on the offensive line with injuries in this game, but Mario Addison did almost all of his damage against Riley Reiff, the Vikings’s starting left tackle all season. Addison ended the game with a sack and seven hurries from 39 pass-rushes, forcing a fumble from QB Case Keenum while in the throwing motion on one of the sacks. Addision is now in the midst of an impressive run of games, and has been one of the best edge rushers in the league over the last month. Elite Stat: Deion Jones allowed 40 yards in coverage from eight targets on Thursday night. If you cast your mind back to Thursday night football you’ll remember Deion Jones ending the game with an interception of Drew Brees in the Falcons end zone to seal the victory and keep the Falcons alive in the NFC playoff picture, not to mention their own division. Jones led the team both in solo tackles (nine) and defensive stops (five), and he had a pass breakup in coverage as well as that interception. Elite Stat: Brandon Marshall allowed just 17 yards yards in coverage against the Jets. A missed tackle was the only black mark against Brandon Marshall in an otherwise excellent game for the Denver linebacker. He led the team with five solo tackles, all of which were defensive stops and on his one blitz of the game he notched a sack and a forced fumble from QB Josh McCown. Marshall was a major factor in the run game, consistently defeating the blocks of Jets linemen at the second level and on the move against pull blocks on power run concepts. Elite Stat: Xavien Howard allowed a passer rating of 0.0 when targeted against the Patriots. 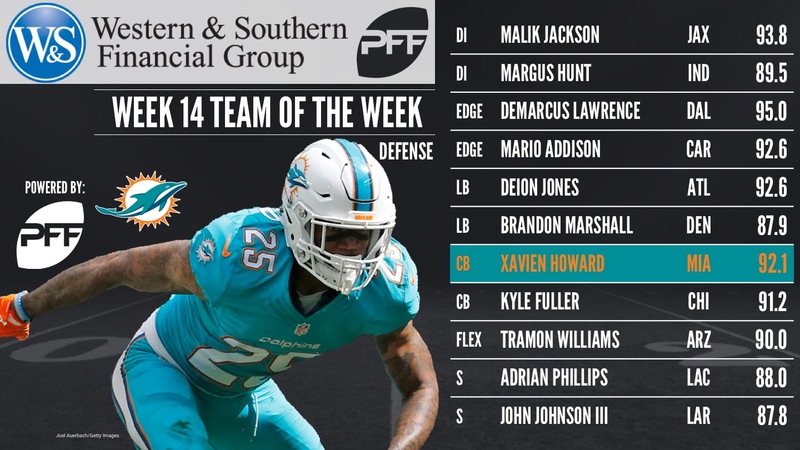 Back to back appearances on PFF’s team of the week for Xavien Howard, who has been sensational over the past three games, two of which have come against the Patriots. Howard was thrown at six times in the game, allowing none of them to be caught by Patriots receivers, picking two of them off himself, and breaking up another incompletion. Howard erased Brandin Cooks from the game, with his only catch coming against a safety. Elite Stat: Kyle Fuller allowed just one catch for seven yards when targeted this past week. Kyle Fuller has had a renaissance this season for the Bears and this was the best game of the best season of his career. Covering A.J. Green for much of the day, Fuller gave up just three receptions for 14 yards despite seeing nine targets, and he broke up three of the incompletions, including two that were intended for Green. In fact, Green caught just one pass for four yards against Fuller, and had to pick up the other 60 yards against other defenders. Elite Stat: Adrian Phillips allowed two catches which went for zero yards when targeted. The Chargers defense absolutely throttled the life out of the Washington offense this week, eliminating them from playoff contention while keeping their own hopes alive. Adrian Phillips saw five targets over the course of the game covering the middle of the field for the Chargers, but allowed just two catches, which went for a total of zero yards. He also notched a pass breakup on a pass intended for WR Brian Quick. Elite Stat: John Johnson had a run stop percentage of 25.0, the best among all safeties this week. One of the better performing rookies in the league, Rams safety John Johnson III had an excellent game against the Eagles. He tied for the team lead in solo tackles with seven, adding three more assists and totaling four defensive stops. His run stop percentage was the best mark in the league among safeties this week, though he did struggle a little in coverage, where he was in close attendance on three touchdowns. Elite Stat: Tramon Williams allowed a passer rating of 16.1 when targeted. Rolling back the years for the Arizona Cardinals this week was Tramon Williams at cornerback. Williams saw eight passes come his way, but allowed just three of them to be caught for 43 yards, while intercepting one himself and breaking up another of the incompletions. Overall, QB Marcus Mariota had a passer rating of just 16.1 when putting the ball into his coverage over the course of the game. Boswell is having a fantastic year in Pittsburgh, even more so considering that the stadium has historically been one of the toughest in the NFL to kick in. In the win over the Ravens, he connected on all four of high field goals tries, including one from over 50 yards, and the game winner too. Hekker averaged a whopping 56.4 yards per punt, and a net of 50.2 yards per punt, both which led the NFL this past week. Three of his five punts landed inside the 20 yard line, and he boomed one for a long of 64 yards. He came very close to finding the end zone, and while he came up short, Mickens big punt return set the Jaguars up perfectly. A second-year player out of Washington, it was Mickens second big punt return of the year. Not just a nifty player out of the backfield, Ekeler proved on Sunday that he can be a core special teams contributor too, with three solo tackles and two assists.